The Sonor Safari shell kit has great sound and projection plus its compact size makes it a perfect kit for gigs and rehearsals. These drums are made from select basswood and you will not believe the sound these drums produce. The 16 inch bass drum sounds great with even the stock head. 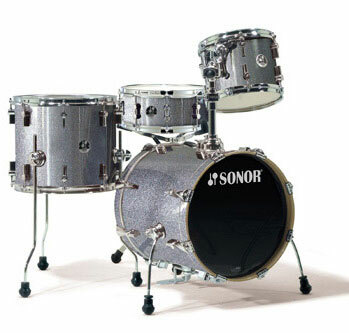 The Sonor Safari drums feature a great looking wrapped finish plus signature Sonor lugs, a telescoping single tom mount, folding bass drum legs, and of course, the great Sonor touch of class. This is the perfect little kit for small, tight spaces or for light weight travel. Shell Kit (drums only), Cymbals and Cymbal stands sold separately. Click Here to see our Huge selection of cymbals. Click Here to see our Drum Hardware Packages. Stellar drums at a real-world price.